Because It's Your Wedding Day! Your wedding dance can be the most romantic moment of your long and happy life together. Don't miss it!!! Very often in life, we look back on things and say to ourselves, "I should have done that." Don't let this happen to you! Let dance instruction from Dance Club Studio be the answer to your dreams. • Impress Your Family & Friends! You know they're going to talk about you if your wedding dance looks great! But, they'll also talk about you if it looks bad! You can make a great wedding dance a reality. Some of our clients use this as a wonderful surprise gift to their guests that will be remembered forever. Dance classes can be tailored to your specific needs. When you combine the fact that Dance Club's prices are the lowest in Cincinnati along with the understanding that this is a skill that you'll be able to enjoy together for the rest of your life, you get true value! Many of our clients comment that their dance lessons were the best buy of their wedding budget! Whether you want to take a single class to increase your confidence and comfort level during your slow dance, or work on a choreographed wedding routine, Dance Club is there for you. We can assist you with song selection, type of dance, rhythm, posture, athleticism, and overall presentation. 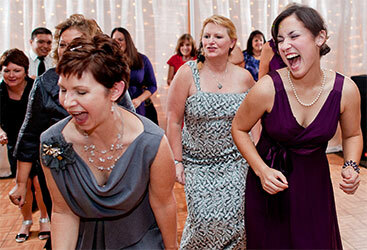 This 2 hour event is a fun and exciting way to practice your wedding dance in front of your wedding party and parents. This will give you extra confidence at your actual wedding reception and have a great time with your loved ones. We will play some of your own music and we'll even give dance tips to your guests! We provide pop and water; you may bring your own alcohol (please drink responsibly). We respectfully request that you limit the number of guests to 20 people - adults only, please. You can even upgrade your party with catering of appetizers or a Full Meal for this special event! Some of our clients have used this party as a low-cost alternative to their rehearsal dinner! For more information contact us at: 513-752-4956 or email us at: danceclubstudio1@yahoo.com.